When it comes to hospitality the importance of music is quite magnified and more importantly the audio systems that are used to play this music projects quite literally into the forefront. This is because it a hotel environment it is the audio system and its associated equipments that can control the level and spread of the music across various spaces within its environs. There was a time when good service, good location and a clean space were all that one needed to run a great hotel. Today, the game has upped the ante by leaps and bounds. Everything is about enhancing the guest experience. From beds to pillows, seating to even fragrances, every nuance is finely detailed. “Music, as we now know directly impacts the brain, neurosystem and moods. Hospitality, in itself, is all about serenading all the five senses of the guests. Music will, most certainly contribute large to the customer experience to create a memorable and positive recall,” said Neha Gundecha – Director, Hotel Sea Princess and Sea Princess Realty. Naturally investing in the right audio systems that will gel with the new age guest is of top priority. The correct implementation of “Noise Cancellation Technology” clubbed with “Wireless Speakers” will allow guests not only to customize the music they listen to but also enhance and select the ambience as per their preference. Hospitality audio systems are getting intricately curated. The volume, pitch etc depends on the space of the hotel it is being piped in as well as time of day. It is all dependent heavily on programming that is integrated beautifully with the experience in a particular space. “For example, the sound on the pool decks will be different from that in the elevator or an Indian cuisine restaurant or an Asian food one,” added Gundecha. Again audio systems are not just solely for providing in-room entertainment and background music but are actively used elsewhere. “Audio systems are utilized in our spas as well. Specially selected music help in generating a soothing feeling before and during treatments and helps in elevating the relaxation quotient at the Shine Spa for Sheraton. The fitness center at the hotel is also equipped and programmed to play high energy music and helps in motivating users for that extra push during their work out. Our associate lounge also plays music which is peppy and upbeat to keep the mood light and jolly for the associates seated there,” said Bakshi. Hotels usually use amplifiers and equalisers that helps in ensuring a uniform coverage of the music. Importantly, the level of music varies on the place it is being played. “For example in corridors it is kept at a minimal as we do not want it to go into the rooms. At the same time it is also used as a means to reduce the noise outside when say someone is walking with heavy footsteps. Again we use different patterns of music based on the location. The lobby to the reception will have one kind of music whereas the restaurants will have another,” said Zaroo. At Howard Johnson, in-room audio background music is not provided. “However, we do play background music at the Lobby and F&B outlets round the clock to ensure that it adds to the ambience and creates a seamless guest experience. Ceiling mounted surround sound speakers play music throughout specialty restaurants, bar lounge, executive lounge and banquets,” said Rajkumar. A lot of hotels also create customized content for their audio systems, to completely control the content. “A hard and soft copy of the audio and music menus containing commercial and popular tracks from various dialects from around the world are available with our team. This is presented to our guests on request and they can freely pick and choose the specific tracks they would want to listen to,” said Bakshi. “We have music professionals who consult us from time to time and create pieces as per our requirements. Our management team focuses on music that directly impacts the customer experience. Hence, even though someone else is creating the sets for us, we have full control on the type of instruments being used, their pitch, bass sounds and soon. We pipe the content through a central control space that further distributes it to the spaces that the pieces have been created for,” said Gundecha. 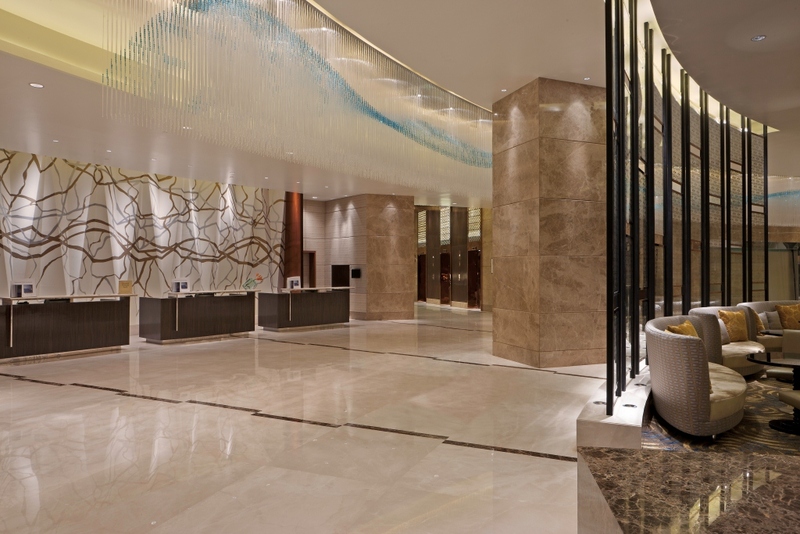 Suresh Ankam- Chief Engineer, The Leela Ambience Convention Hotel, Delhi added, “the content that we create for each area of the hotel depends on the mood of that area and can be changed according to changing moods. We have individual local controllers that can be used to control to control individual areas; apart from that we also have a centralized web based control system. As for the technology interface, we use a web based online music player called “Down Load Player” based out of Singapore.” Likewise at Howard Johnson, the hotel can play customized content music via visual video wall and online music via laptop set up at their MAREA Bar Lounge. “Following the recent trends, the audio systems also undergoing advancement and innovation, and most of the hotels use their F&B around various concepts. We use ceiling mounted surround sound speakers,” explained Rajkumar. Like with everything in a hospitality space, audio systems are designed to bring luxury and comfort to guests. “Our venues and rooms are equipped with state of the art inbuilt speakers with surround sound capabilities ,this gives a further enhanced experience for our guests with quality of sound which is the best in the market and also generates a real life sound experience,” avered Bakshi. Ankam added, “we have a high end IP based music setup with local controllers which are also the USP of our audio system. These enable us to make changes and incorporate the choices of our guests in the audio selection. In this way we put our guests preference first making them feel at ease and comfortable.” Music industry is a rapidly changing and being hospitality industry, there is a need for hoteliers to keep pace with advance audio systems being re-invented. “Also, placing audio systems is not sufficient but it is very pivotal that it is placed in the desired location or spot which will help us in engage better with our guests/target audience. We mostly go with audio systems with the décor and interiors of the hotels. And being a fairly new business hotel the music systems installed are up-to-date and are in trend with the latest technology as well,” says Rajkumar. Likewise another element is to ensure that the audio systems are tamper-proof especially in public domain areas like pools, bars and banquet areas. Usually the technology team at the hotel is responsible to ensure this kind of safety. Technological advancements also play a big role in ensuring that audio systems are tamper proof. All speakers and audio systems are usually monitored and modulated from a central control console. This can also help make changes to the entire audio as a whole or individually giving the hotel uniform coverage as per their need. “The speakers at the venues rooms and public areas in the hotel are inbuilt into the structure which makes it difficult for anyone to tamper or damage with both the software as well as the physical body of the console,” added Bakshi. “The audio system that we use is web based and connects the server based in Singapore directly with our hotel. As the system is centrally controlled and no CD’s or pen drives are in use; tampering is not an option. Also, the audio console is a separate setup and is not visible to guests as such,” said Ankam. “We are working on different environments and are also checking out BOSE audio systems. We have successfully adopted JBL audio systems for our outdoors. Kashmir has really harsh environments with rains and extreme weather, so we have kept them in such a way that they do not appear as an eye sore,” said Zaroo. New age guests are particular about what music they want. Also they usually carry their own entertainment and expect an easy connection between the TV screen and their laptop or iPad. “We have installed what we call entertainment systems as part of our in room entertainment in all our rooms and a guest that brings in their own music can play it inside the room. In fact this was a concept that was quite unheard of even as recent as 5 years ago. So what we plan to do in our newly renovated rooms is to have music players with Bluetooth facility so that they can connect to the user’s phone and play their music. This can also be used as a wakeup call. How it works is that when it is the time when the guest wants to be woken up, the radio switches on automatically and that would again introduce them to the local culture of the place while updating the latest news at the place. The only concern we have which is why we have not already installed it is the nuisance value it could create at times but we are definitely working on mitigating any issues,” avered Zaroo. Most hotels today have LED television sets in each room that provide the possibility of connectivity through multimedia ports such as the HDMI that help interconnect various devices, without compromising on security. The “Teleadapt” system is something unique to Sheraton Grad Bangalore which is a one point docking system with multiple docking ports for guests to easily connect their devices to the various consoles in the guest rooms. Naturally the fundamental aspect is to be able to choose suppliers who can provide high-quality music and video content on a number of platforms including Digital TV, IPTV, the internet, mobile devices and game consoles. Availability of a variety of audio and visual equipment which is trending in the market and most importantly providing post purchase and installation servicing is something that most hoteliers look out for when choosing vendors. “The most important thing in choosing products is to keep in mind is the quality and as a company we cannot compromise upon that. At the end of the day it is important to understand that we are running a commercial business and we cannot use low grade products as they are not just handled by us but also guests who come from all across the society. At the same time it is important that the product is simple to use and provides all the important features at the same time. All guests may not be very comfortable to use the product and hence the product must be simple,” said Zaroo. A good system helps create the mood and can set the tone of the guests’ experience, whether it is for business or for leisure. “While the FSR 1032 background music system is perfect for hotel audio, it can be used in plenty of other business settings! Clubs and pubs on the other hand need a high power system such as the JBL STX800/ SRX800, which is capable of delivering powerful sound,” opined Rajkumar. The bottom line with making the investment in audio systems in a hospitality environment is guided by guest’s needs for the hotel’s brand philosophy. Hoteliers naturally are looking at making wise investments that will work with the new age millennia. With the new wave of digitization, hotels are all set to make audio an important part of the overall guest experience.